As we noted in an earlier post, we are taking a slight detour in our Race to Zero. We are testing older stoves made in the 1970s and 1980s. 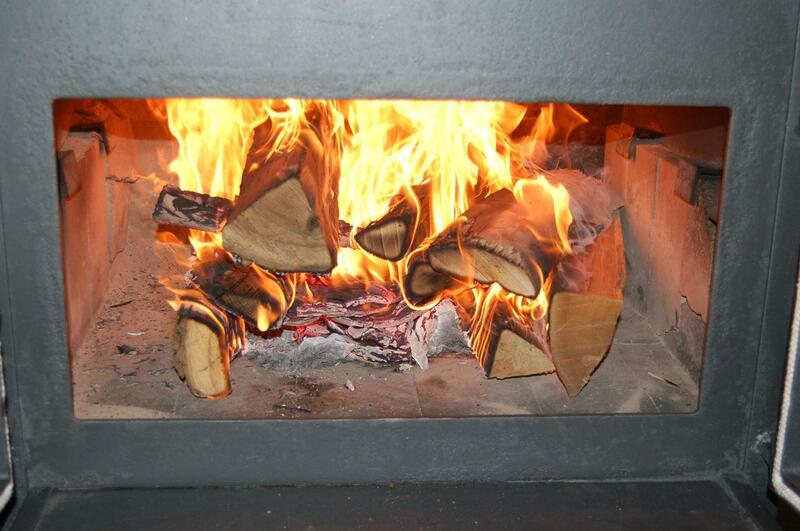 Stoves which were made with little technology to reduce emissions or improve efficiency. Our first test stove is a “Huntsman” (made by Atlanta Stove Works, circa 1977) step stove. 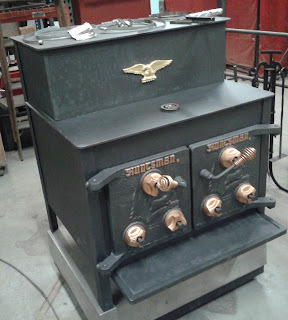 It is a welded steel stove, with a huge firebox (well over 5 cubic feet), and cast iron doors with six draft controls. The bottom is lined with firebrick, and the side walls are also lined up to 9” in height (one layer of firebrick). 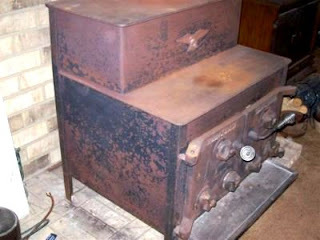 As with many steel stoves of this vintage, the stove itself is almost “overbuilt” (1/4” and 5/16” boiler plate), and as long as the firebricks are replaced periodically, it will last for a few more decades. 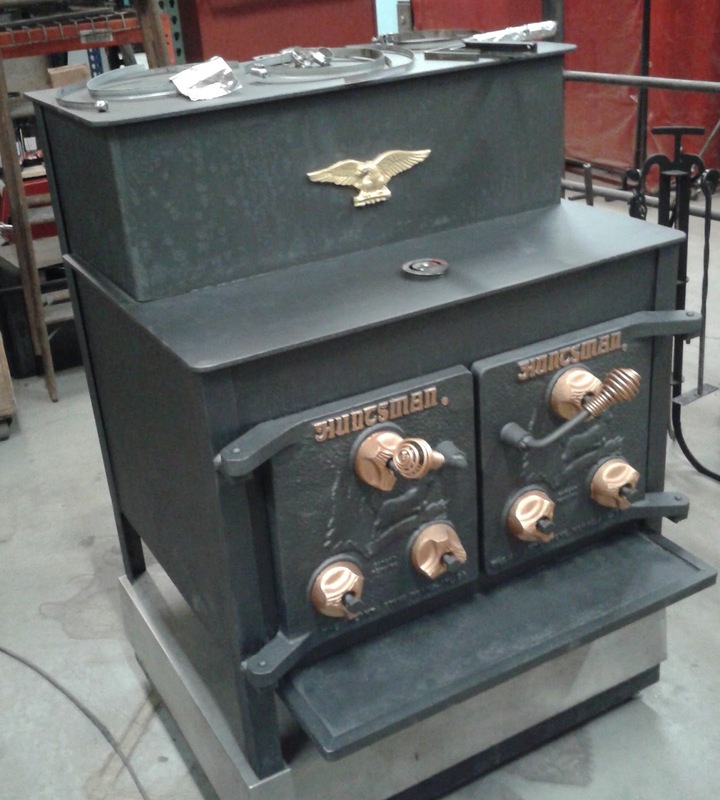 Interestingly, even though the Huntsman stove is physically huge, it weighs almost exactly the same as our new Absolute Steel Hybrid - just over 500 pounds. 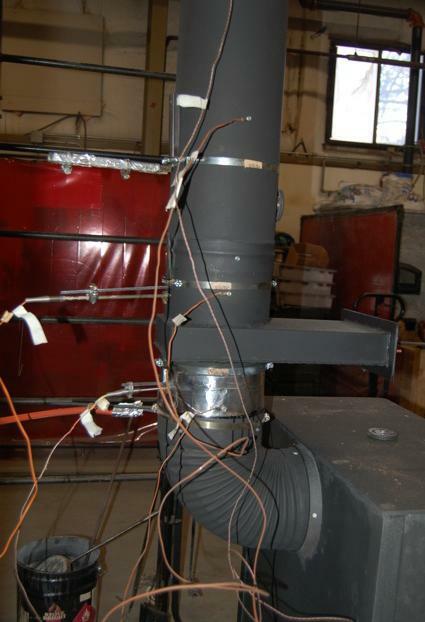 Our first goal is to establish a careful baseline profile for these older stoves in terms of heat output, emissions, and efficiency at low, medium, and high burn rates. Next, we want to see if we can design a retrofit catalyst and heat exchanger that will improve the performance metrics (heat output, emissions, and efficiency) enough to make them competitive with some of the stoves in today’s market. We have wired the Huntsman in our research department so that we can measure surface and gas (O2, CO2, and CO) temperatures at multiple locations. The stove is on a scale, which allows us to measure the rate of fuel consumption. Finally, we can (and will) get particulate catches for most of the baseline runs using Method 5G3 (the same Method the EPA uses). We will use the Canadian CSA B415 algorithm for calculating efficiency. We are trying to run parallel to the same methods and standards used by the EPA. We are using cordwood for our testing because it is readily available, and is much less expensive than the cribs the EPA has used for emissions testing during the last few decades. We’re doing our best to keep loads representative in terms of species, weight, and moisture content. One of the nice things about R&D testing is that we can operate with a certain degree of informality that you can’t do with certification testing. We are just interested in seeing if we can “move the needle” before we pay attention to all of the fine points of test protocol. 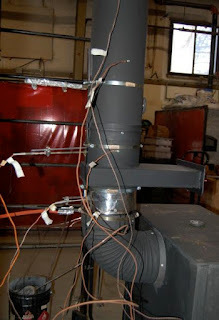 We hope to get baseline data on at least three stoves (one small; one medium; and one large), and we hope to develop mathematical models for different aspects of our testing – an example would be the heat transfer achieved by our device. More on that in the next week or so. Obviously, there is an opportunity to reduce emissions in old stoves. We think there are additional opportunities to extract more heat (both by radiation and convection) around the area where our device would be installed. Without getting too esoteric, we may be able to point the catalyst directly at the surface(s) we want to use as primary radiators. Finally, the catalyst should introduce a considerable pressure drop into the system. This resistance may result in increased stack temperatures around our device, a reduction in stack flow, a lowering of the burn rate, and some improvement in efficiency. Well - we are hoping to get these results! The questions are: (1) How much of a reduction in emissions? (2) How much additional heat extraction? (3) How much of an improvement in efficiency? (4) At what cost and what degree of difficulty? We expect to be busy in the lab with this project for 3 to 4 months, at least. We don’t know if we can succeed with this R2Z Detour, but we think it’s worth making a serious effort.